Two men and two dogs were in a boat sailing into Tamales Bay in Northern California on Monday when it capsized in the rough surf. One man and one dog were rescued, but Brian Phidat Ho, 47, was killed. The other dog, a yellow Lab named Yoda, disappeared and had presumably drowned. This morning, three days after the accident, Marin County Fire Battalion Chiefs Chris Martinelli and Graham Groneman were scouting locations for a water rescue orientation for firefighters. They spotted something from their rescue boat — a yellow object on a rocky shore north of where the boat had capsized. Despite his ordeal, Yoda was alive and well, and appeared to be uninjured. He was taken to the Tamales Fire Station, where he warmed up by the fireplace while being given food and water. Nice, indeed. And how nice that those two Marin County Fire battalion chiefs just happened to be in the right place at the right time. Last year, a German Shepherd/Husky mix named Luna was found five weeks after she jumped off a boat. 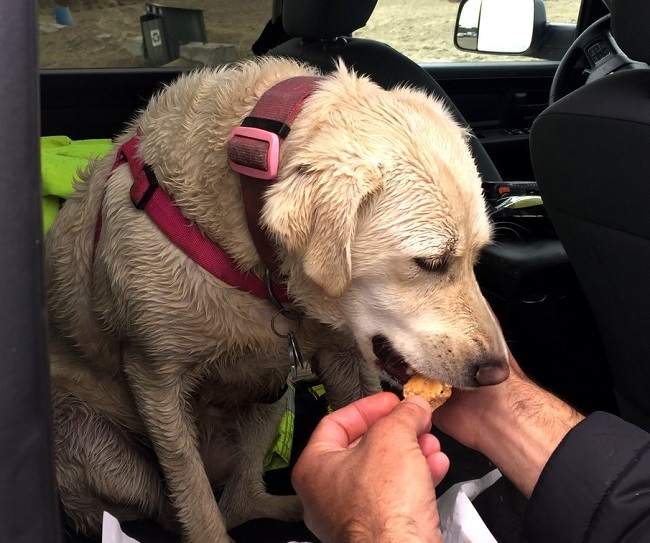 Luna had managed to swim two miles to an island used by the Navy.